Difficulty: Making it is easy, photographing it before it turns into a puddle is difficult. Still working my way through the most difficult recipes. I've been looking forward to doing the baked Alaska, it is just so fun to make and eat. Anyway, I'm not sure if this recipe deserves the title 'most difficult'. All things considered, it really isn't that hard. The trick is having everything frozen solid before covering it with meringue and transferring it to the oven. 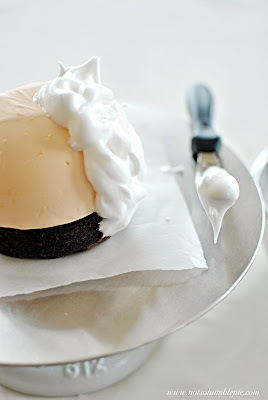 The meringue acts as an insulator and keeps the ice cream cold throughout the baking. This version of baked Alaska uses orange ice cream atop a brownie in a pool of dark chocolate sauce. Feel free to substitute store bought orange sorbet for the ice cream if you lack an ice cream maker. You simply need to soften the sorbet/ice cream and fill a mold and let it freeze until solid (usually overnight). Hemisphere molds are commonly used for baked Alaska. Though, once you take a simple stainless bowl and slap the name 'hemisphere mold' on it, they get expensive. I'm not really sure why, they're absurdly priced at my local baking store. However, I found some inexpensive metal bowls that can serve the same purpose at Ikea and for a lot less. Metal hemisphere molds are not a requirement for this recipe, you can chill your ice cream in any container you wish, lined with a little plastic wrap for easy removal. Place your molds into the freezer to chill. In a mixing bowl, whisk together all the ingredients until thoroughly combined. Add the mixture to your ice cream maker and churn according to the manufacturer's instructions. When the ice cream is done, divide between your molds (if using a ceramic or plastic mold line with a bit of plastic wrap). Press a little plastic wrap onto the surface of the ice cream and freeze until solid (this will take at least overnight). Add the cocoa to a large heat-safe mixing bowl and set aside. In a medium saucepan, combine the cream and sugar and cook over medium heat until the sugar dissolves. Stir in the corn syrup and then bring to a boil over medium heat. Remove from the heat and pour half of the mixture into the bowl with your cocoa. Whisk by hand until smooth and then add the remaining cream. Whisk the mixture until uniform and then strain though a fine sieve back into the sauce pan. Cook the mixture over low heat until glossy and large bubbles form (roughly 5 minutes). Remove from heat and allow to cool slightly. Serve warm. Store any extra sauce in an air tight container for up to two weeks in the refrigerator. Now you're ready to prep the ice cream (provided it is frozen solid). Warm the molds in a little hot water to melt the surface and press them out onto a baking sheet lined with parchment paper. Or, if they were lined with plastic wrap, use that to remove from the mold. Place the unmolded ice cream into the freezer once again and chill until solid. Bake a pan of brownies (I'm using Ghirardelli brownie mix because I'm an unforgivably lazy food blogger today) and cut out 5" rounds, one for each mold. Allow to cool to room temperature and then transfer to the freezer for 30 minutes. When the 30 minutes is up, preheat the oven to 345°F and whip up the meringue. In large bowl, beat egg whites and cream of tartar with electric mixer until foamy. Gradually add sugar, beating until mixture forms stiff but still glossy peaks. 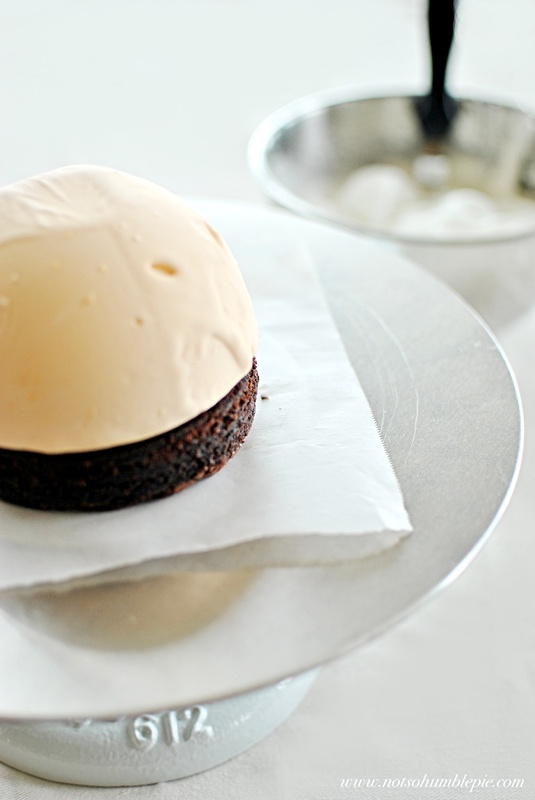 To assemble the baked Alaskas, place the brownie onto a baking sheet lined with parchment. Working quickly, top the brownie with the orange ice cream and slather on a thick layer of meringue. Now some freeze the baked Alaska for a couple hours before baking. However I don't like my meringue frozen, so I bake immediately for 10 minutes or until the meringue has a golden blush. If you're ice cream is solid and you work quickly, baking it immediately will not be a problem. To serve, coat a plate with the prepared chocolate sauce and place the baked Alaska in the center. Serve immediately. One 5" baked Alaska should serve 2-4. I have never had one and now I want one very, very badly. Great. I want to make this now. Looks impressive and involved to me! Nicely done! oOooOoooOOo! looks impressive. and now I'm hungry. ive always always always wanted to make a bake alaska for my husband or at least take him to a place that sells them but i can never find a place that does, in all the cities we've visited! they are sooo delicious!! Wow, your Baked Alaska looks lovely. Having a blog in Fairbanks, I have always wanted to do a Baked Alaska post. I love that you made your own ice cream. Most recipes that I find call for softened store bought ice cream. Nice job. I can't believe I've never heard of this!! It is absolutely stunning!! I must make this soon. I love the idea of orange ice cream atop chocolate brownies. I bet you could use other ice cream flavors, too!! Great job as usual!!! chocolate + orange = heaven...I am thinking of buying an ice cream maker now! Lovely!! This is on my list of "to-do" recipes this year! I've seen this done using a blow torch to brown the meringue rather than a hot oven. Really quick! Looks stunning... but what happened to parts two and three of the croissant recipes?? I was really looking forward to those, because you posted #1 exactly two days after I independently attempted (and failed) at making them, and was hoping to get it right on my second try. I made baked alaska once and it was no where as near as beautiful as yours! I see you saved the very best pic till last. What an amazing baked alaska, hats off to you! The croissants are coming (I can do them today). I had prepared a third batch of laminated dough for them but when I got sick last week I put that project on hold. For so long in fact, that I had to toss the third batch of dough. All 5lbs of it, a whole day's work (sigh). At least the second batch came out great, so I do have something to post. Tricks? Well, a scrupulously clean bowl and whisk. Since any trace of oil or grease will kill a meringue. Have your whites at room temperature before beating, or beat them over a bowl of warm water. Use a copper or stainless steel bowl. If using stainless add a dash of salt, few drops of lemon juice, or a little cream of tartar at the beginning to help strengthen the whites. Then don't over beat. If you beat too much the whites will unfold and become grainy and weepy. I have a kitchen torch but it always over-browns my meringue. I like the light brown color I can get from the oven so I usually reserve my toarch for melting sugar. 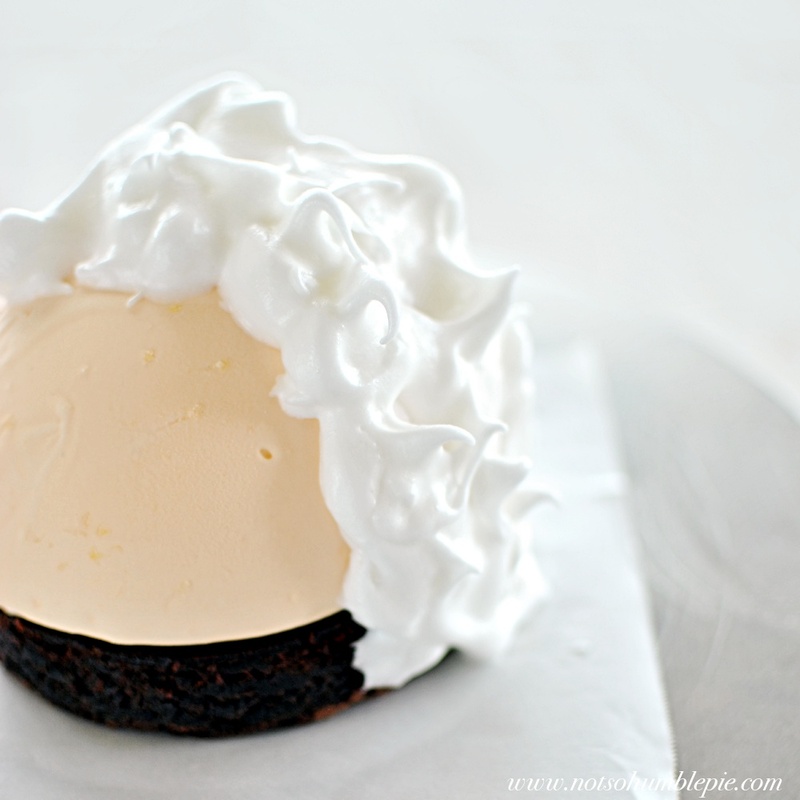 Thank you for being so specific--I made this today with my favorite brownie recipe and cookies 'n' cream ice cream, and it came out AWESOME. It wasn't pretty, and I need to make sure I cover the ice cream to a uniform depth (one side got a little under-coated and melted faster than the other), but it tasted excellent. P.S. Wilton's "Sports Ball Pan" makes a 6" ice cream round, and I used their 6" round cake pan to make the brownie portion. Perfect fit, and the pans aren't that expensive. After lengthy searching I finally find your recipe. Here in NZ we use gingernut biscuits and a caramel sauce. Will let you know how I go with my version.